http://www.vintageracerules.com/forums/ubbthreads.php/topics/14439/Re:_RACING_ENGINES,_A_TECHNICA#Post14439) do not miss the article reprinted from Kevin Cameron!! Read it several times! 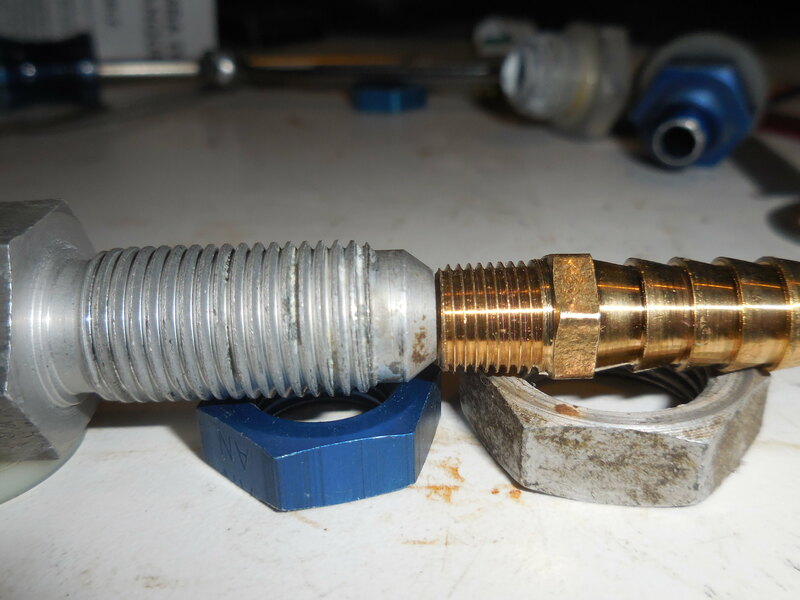 These are the things that happen to engines that most of us have a hard time understanding. Great info!! 165 hp from a 2 port farm tractor engine is amazing. Using these numbers the original Grenade would have made over 120 hp!! and we all know the effort that Chris and Mark put into it . Fordboy, thanks for the info!!! Thanks for pointing out Cameron's discussion of Spintron learning. As usual, it's excellent. I've read a whole bunch of Kevin's writings, but need to look up more of his recent stuff. If anyone is on Facebook, Billy Godbold has pretty good discussions on his page concerning Spintron results regularly. Between Billy's stuff on social media, Mike Jones' posts on ST, and the late Harold Brookshire's on ST and the Chevelle forum, you can learn A LOT about racing camshafts. You can also access Harvey Crane's site still on Wayback archive. I have all the graphs from his site that you can look at along with the text on his site. PM me if you want them. As for Aaron's engine, he has had the airflow to get there and found some other improvements in the head, going to the .875" lifter in the GT-L engine (FP restricts this to stock size) helps him out in getting there, but it took the fuel injection for the engine to be able to keep up with the fueling - the ram tuning doesn't hurt one bit either. He's a very sharp guy and is applying a lot of modern racing engine techniques /knowledge to these old lumps. When it has been a tough week, it helps to maintain some perspective . . . . . 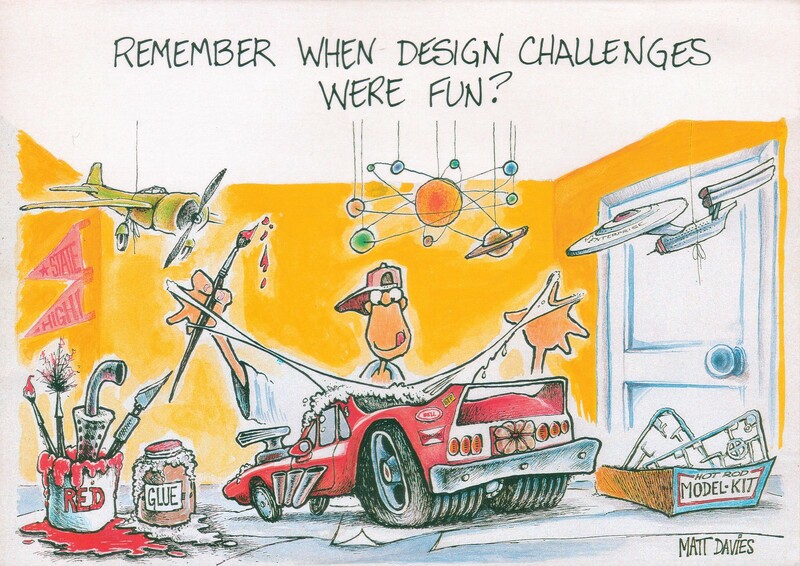 This framed cartoon has been hanging over my desk in my office, at every venue I have worked at, for the last 36 years . . . . . It now hangs over my desktop in my "dungeon laboratory". I'm not sure if it helps to reflect on how I started "down the wrong path" . . . . . . . . .
And you're STILL hanging out with us . . .
er . . . uhhh . . . I mean, THEM . . . I have a "vague" recollection that it may have been first-hand glue "intoxication" . . . . . .
At least it would explain the fascination with weird beers . . . . . . Since a picture is worth a thousand words . . . . . . 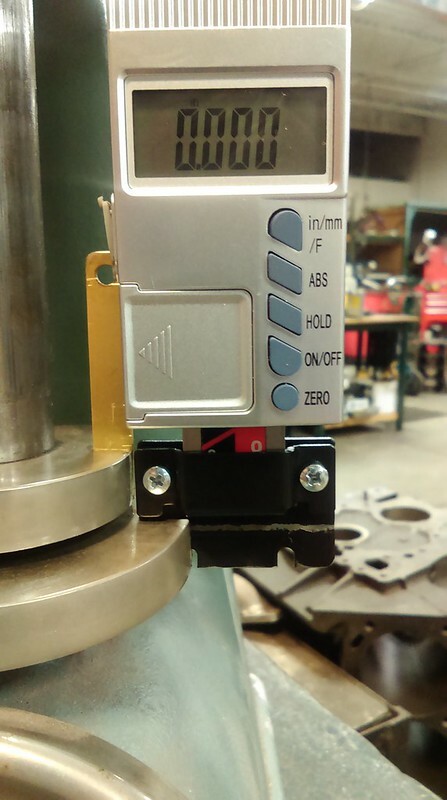 Here are a few thousand words about how you can upgrade an older Rimac Valve Spring Tester to digital vertical measurement . . . . These spring testers were the "state of the art" for decades, but lately have been supplanted by fully digital spring checkers, also with data recording capability. Very trick for the "Pro" engine shop, but way over the top for home builders and other small shops. And although the company that produced them has ceased doing business, they are available sporadically on "fleabay". The selling price varies according to tester capacity and condition. Expect to pay $300 to $500 for a 350# to 500# unit in good to nice condition. Expect to pay more for a 750# or 1000# one. Some examples are really "beat up" so check carefully. Calibration springs are still available for most ranges, check ebay or Comp Cams. 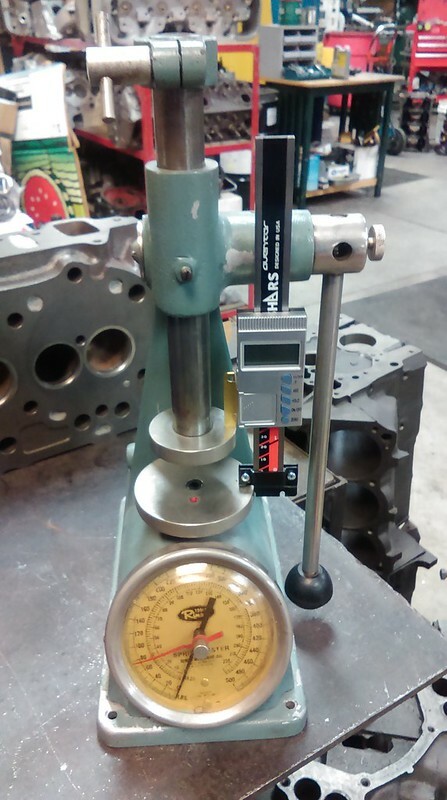 Comp Cams also has a 1" dial indicator height accessory that can be set to measure in one inch increments. Well, yeah, there was a lot of effort, but I think we could have made a bit more hp. I have dyno sheets from the early 90's for 998 BMC F/Juniors that produced 105 bhp. I estimate that 108 bhp would have been about the most we could have gotten from the "Grenade" without turning it into a "hand grenade" . . . . .
2 problems here, fuel curve of the Weber Vs the linear fuel delivery of the EFI. Better atomization of the EFI, although this may not be so important with BMC's. Notice the very flat torque curve of the EFI. Typically, an engine's Tq curve "duplicates the shape" of the bsfc curve. In a Weber, the overall curve is a product of the emulsion tube and jetting. 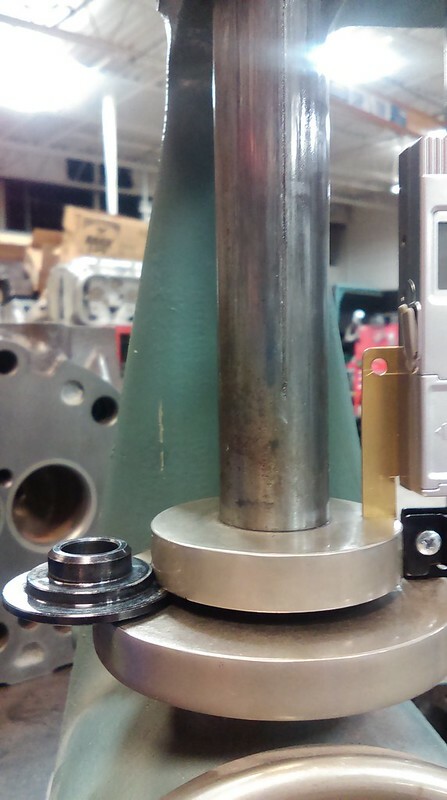 We spent a lot of time on the dyno "flattening" that curve with various Weber parts. After 2 days of dyno pulls, it was as good as we could make it. I seem to recall we tested 8 different emulsion tubes x various jet sizes. LOTS of pulls. Flattening out the top of the bsfc might have been worth 5 bhp or so . . . . .
We should have used a "domed" piston to get the static C/R up from where we were, into the 14.5/1 range. It was an expense that Chris did not choose. 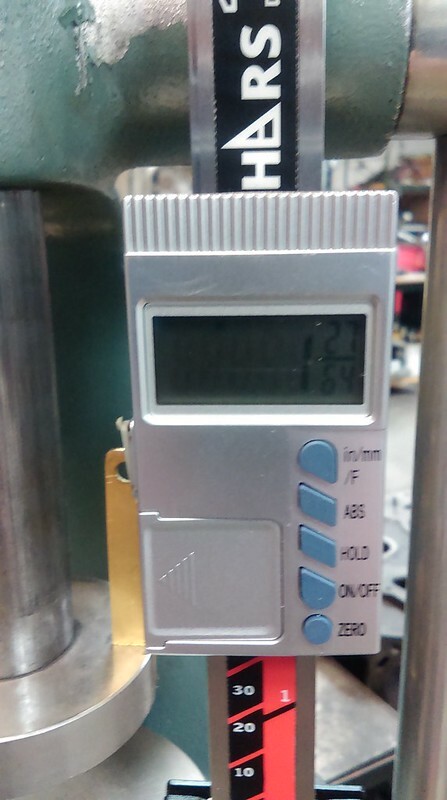 And the BMEP we achieved, 183 psi, proved out that the static C/R was "light". 195 psi BMEP Vs 183 psi = +5 #/ft Tq @ 8100 5 #/ft = 7.7 bhp . . . . . Aaron's engine is 204.8 psi, very well developed. As an aside, it is MUCH easier to get to 14/1 C/R with a 1310 cc engine Vs a 999 cc engine. 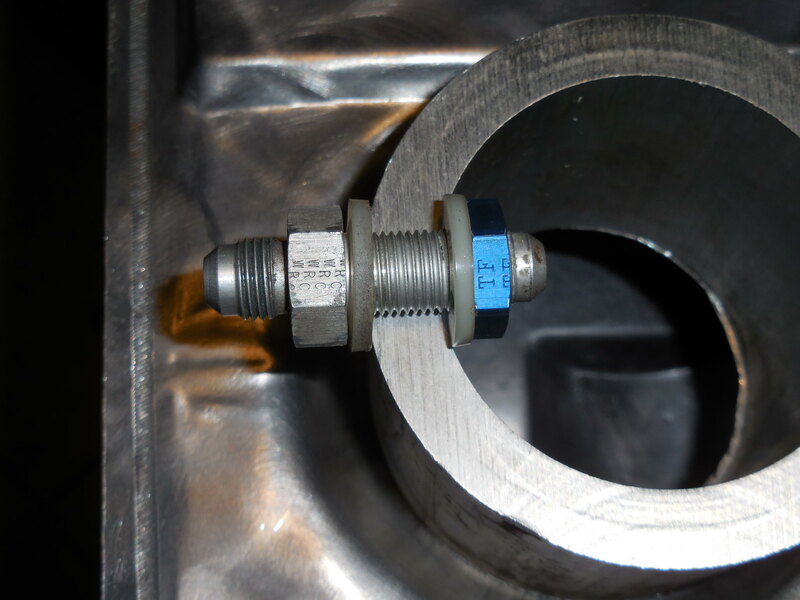 Again a domed piston with deeper valve notches would have allowed a different cam spec. + ? bhp . . . . This is an unknown, but 3/5 bhp is reasonable. But, as always, hindsight, is usually 20/20 . . . . . . The trick is to turn hindsight into "foresight". Mark's been bugging me to post up something. After all, not ALL of the fun happens in Illinois . . . I'll be utilizing the original fuel send as a return line, so I removed the sock from the original pickup in the tank and relocated it (aka "bent it") so that the return fuel is less prone to aerating the fuel already in the tank. To further "still the waters", I'll be cutting a hole in this fuel cell foam, which will be held nominally in place by the fuel pump and the required bracketing. Oh - and the connecting rod bearings arrived yesterday. Mark, I assume you are indicating that the dry sump may be worth 3/5 bhp more than the wet sump system in the "Gernade". 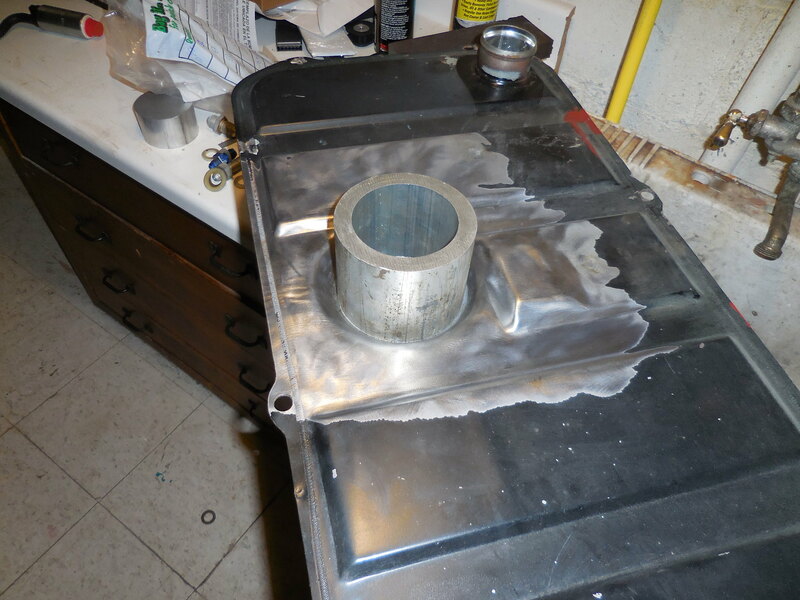 In one of Smokey Yunicks sb chevy books he states "Make no mistake, switching to a dry-sump will cost some power". He says in the sb chevy "at least 8 to 10 HP or more over a wet-sump". So is this windage vs dry sump pumps? I'm not questioning your knowlage on this, I'm just trying to increase mine. 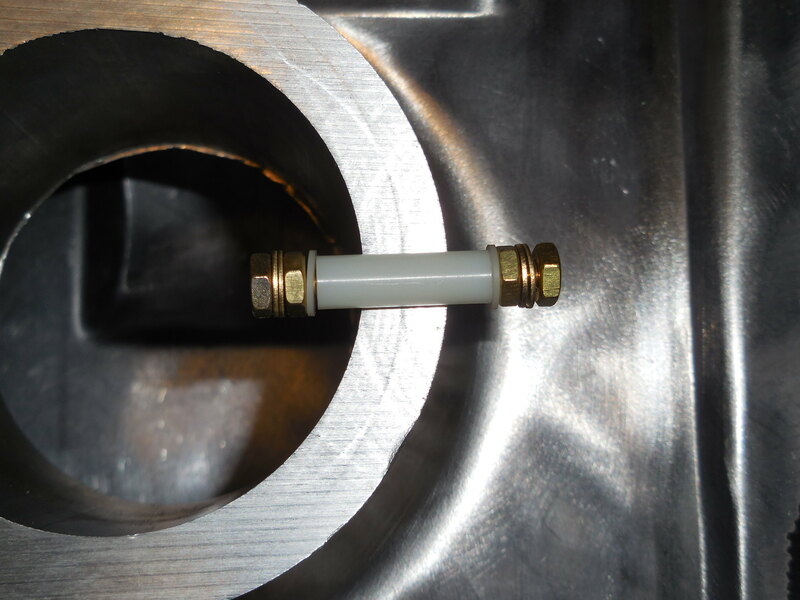 Also, typical road car practice these days for fuel system plumbing, at a high level, is for returnless fuel flow. Connections need to be a bit tougher, too, with ~5 bar output. 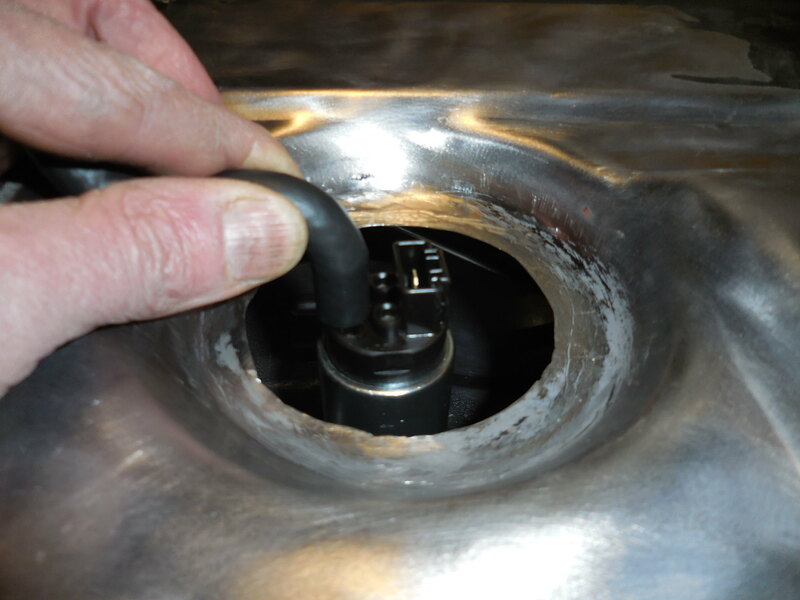 Returning fuel flow was previously the more or less universal method; that has the effect of perpetually recirculating fuel between tank and nice warm engine bay (fuel rail bolted to nice warm engine etc) so gradually warms up the tank content. Evaporation emission is then an issue (for a road car) plus there are more joints to go wrong, fuel aeration to handle, hot fuel in low tank level,etc. Would there be an inescapable driver to return fuel from the engine bay to the tank for this project? Bulk fuel won't be cold for long unless there's loads of it to absorb engine bay heat and dissipate it via tank walls into underfloor air flow but that's warm too, isn't it, from engine outflow and exhaust. Road cars use nylon fuel lines routed away from the trans tunnel and exhaust, plus heatshielding. Fuel arrives cold at the engine, or at least not warmed up. Nylon can be moulded so shaped to the underfloor, allowing again less joints (as above). Is there perhaps a rule about hard fuel lines required to be metallic? If so copper is easier to bend than steel. Would you want cold fuel? If so perhaps a returnless fuel cell in a bucket of ice would do cold fuel well. Yes, more fab, more leak opportunity, more of (not my) cost. Its easy for me to speculate about how to spend someone else's money. And there would have to be some ice; the salt pix look like it's a warmish place compared to Blighty so it'd be necessary to take a huge bucket of ice from the hotel..
Or a fuel cooler. Yes, your modern road car has that, too, in at least some cases. Just, as they say, my two penn'orth. There is a lot of information that Smokey shared, that while probably true at the time, just hasn’t hold up. This doesn’t mean he wasn’t smart, just that 30+ years of engine development later, people have learned things and found ways to measure other things. With the dry sump, you can pull a lot of crankcase vacuum (NASCAR engines pull 20in/Hg +). This allows one to obtain better ring seal. It also allows one to run low tension rings and get them to seal. You make horsepower due to better ring seal and you make horsepower with increasing rpm by reducing drag. The ring/bore interface is responsible for the most friction in the engine and increases exponentially with rpm. NASCAR engines have blowby numbers in the neighborhood of .1%. 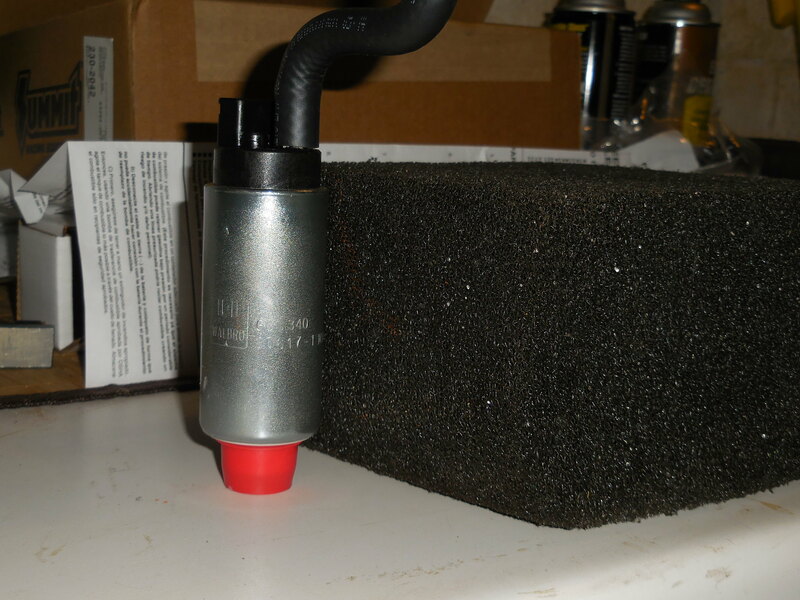 A lot of wet sump drag and circle track racers use dedicated vacuum pumps for this as well, but dry sump is the way to go if rules allow and you have the money. With really high vacuum numbers however, you’ll need piston oil squirters to get oil to the small end and the pins have to be DLC coated. Keep it around 10in and you’ll get benefits without all the other engineering. Remember, NASCAR engines are using rings down to .7mm thick. Those are available for small bore applications as well. I know Aaron has worked with CP on pistons for that engine and no doubt he’a taking advantage of what he can. The biggest gain for Aaron with EFI was just getting enough fuel into the engine beyond what the SPVP-5 and the HL12 could make power up to. Blank slate, EFI allows one to straighten out the runners, give the runners an ideal taper (and not to fit whatever carburetor you need to fit), and lack of parts in the way (booster) + lack of change of CSA (venturir) allows ram tuning to be MUCH more effective!